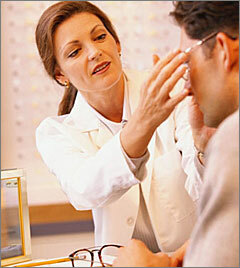 Why Use a Certified Optician? The American Board of Opticianry & National Contact Lens Examiners (ABO-NCLE) is the largest and most prestigious Opticians’ certification organization in the world, recognizing individuals whose Opticianry skills and knowledge meet predetermined standards of excellence. More than 96,000 certifications have been awarded since 1976, and more than 40,000 certifications are currently in force. ABO, the American Board of Opticianry, certifies Opticians – those who dispense and work with spectacles (eyeglasses and eyewear). NCLE, the National Contact Lens Examiners, certifies those Ophthalmic Dispensers who fit and work with contact lenses. Our certification exams are continually refined and updated to reflect current practices and to ensure that they are fair and accurate measures of professional competency. ABO-NCLE meets ANSI Standard 1100 for professional certifying organizations. As a result, ABO-NCLE certification is highly regarded nationally and internationally, earning recognition from state licensing boards, the U.S. military, and public and private corporations. You can’t buy it; you have to earn it. Certification is professional distinction – official and public recognition of your achievement that your service provider has met a national set of standards as a qualified and competent Optician or Contact Lens Technician. Certification is your assurance that your eye wear needs are being competently and carefully fulfilled; certification is recognized by employers as a standard of competence.